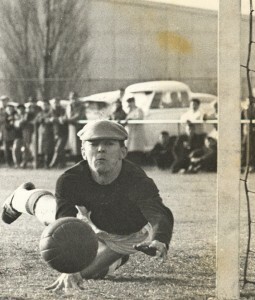 Norm Hobson was one of Australia’s best goalkeepers in the 1950s and 1960s. He arrived from England where he had played with Leeds United in 1955 and joined Moreland, quickly becoming the first choice keeper. He helped the club win the Dockerty Cup in 1957, playing alongside Ted Smith, Frankie Loughran and Don Hodgson. In 1960 he moved to George Cross where he was the keeper when the club won the Australia Cup in 1964, beating APIA in the final. 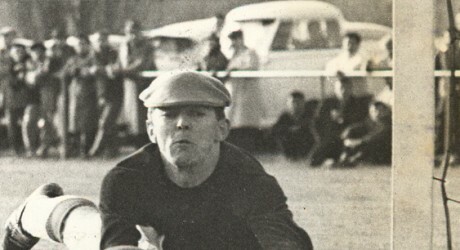 George Cross was runner-up in the league in four seasons while he was in goal for the club. He had spells with Wilhelmina and Croatia and time in Sydney with APIA while he was working in New South Wales. 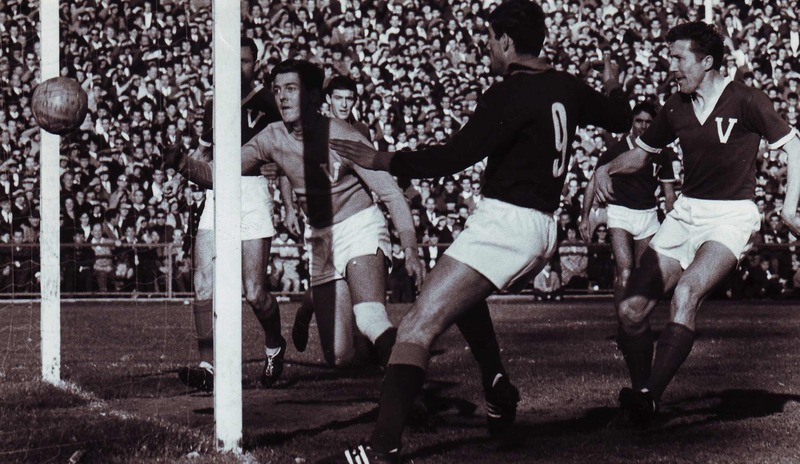 Nigel Shepherd behind the post, Norm Hobson and Ricardo da Silva (9) of Roma and Vic Janczyk, right, Victoria v AS Roma at Olympic Park on 29 May 1966. Photo: Uwe Kuessner. Source: Laurie Schwab collection, Deakin University Library. 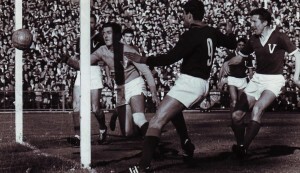 He played eleven games for Victoria including starring performances against Everton in 1964 and Chelsea in 1965. His performance against Chelsea won him selection for the Australian squad, but John Roberts was preferred to him in the two matches in Sydney and Melbourne. In 1966 he played in front of a crowd of over 35,000 at Olympic Park (and many more perched on vantage points outside the ground) against AS Roma from Italy. He had offers to return to England to play but preferred to continue in Australia, where he found a home and a great reception at every club with which he played. Of his time at George Cross he said, ‘I look forward to my future with George Cross and I have never been happier, I would also like to say that the people at the club, whether they be Maltese, English, Scottish, or whatever, are the greatest bunch of fellows I could possibly ever wish to be associated with. I am happy to wear the goalkeeper’s jersey for as long as the club thinks I am good enough’. 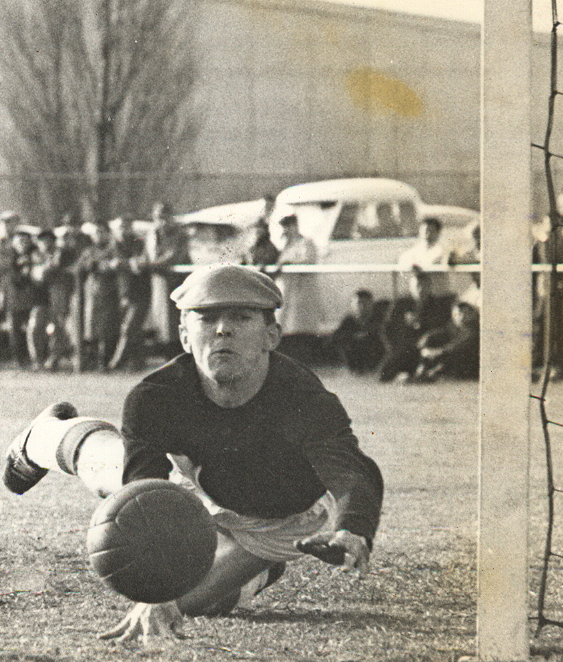 Norm Hobson diving to save for George Cross against Slavia Port Melbourne at SS Anderson Reserve or Murphy Reserve as it was known in the 1960s. This information from Victor Brincat. Source: Laurie Schwab collection, Deakin University Library. My thanks to Ted Smith, John Punshon and Victor Brincat for their assistance. ← Looking for the ideal Christmas present?